What’s All the Hype About CrossFit? CrossFit. It seems to be all the rage. Gyms just for CrossFit are popping up everywhere with family members and friends of mine joining this latest fitness craze that has taken off like wildfire. So I went exploring to check it out and see what this so-called “ultimate power combination” was all about. I checked out a few nearby facilities, reviewed their membership plans, and even contemplating investing in a CrossFit gym not too far from my home. But in the end, I decided CrossFit wasn’t for me (due to my longstanding lower back issues) but it might be the right fitness regimen for you! Here’s more. Greg Glassman first came up with CrossFit back in the 1990s. Prior, Glassman first coached gymnastics at a local YMCA in Southern California and later trained professional athletes and celebrities in local gyms. He discovered high intensity workouts worked best with his clientele and later concluded bodybuilding and endurance programs should be incorporated when he began training law enforcers. In 1995, Glassman took his developed fitness technique and opened up his first official CrossFit gym in Santa Cruz. His program received immediate attention and recognition. Six years later, he launched crossfit.com as an open source program – meaning anybody could now use his program – that includes a library of workout and exercise demo videos, an active discussion forum and the Workout of the Day. Then a few subsequent years later, Glassman took CrossFit to another level by launching an affiliation program. 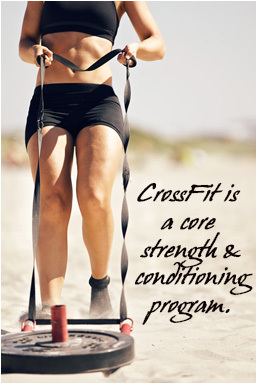 Today, members of more than 9,000 affiliated gyms practice CrossFit worldwide. Getting back to the program itself. CrossFit is a very unique strength and conditioning exercise regimen with the goal of bettering one’s muscular strength, cardio-respiratory endurance, and flexibility. This is accomplished by stringing together a perpetually varied mix of skills and drills that most commonly associated with Olympic weight lifting, gymnastics, and metabolic conditioning. All movements are continuous, diverse and performed at high intensities to help the exerciser to ultimately become more dexterous with their accuracy, agility, balance, cardiovascular endurance, coordination, flexibility, power, speed, stamina, and strength. Workouts include short but intense movements using your body weight, such as air squats, back extensions, box jumps, burpees, cartwheels, dips, handstands and handstand push-ups, hanging knees-to-elbows and toes-to-bar, hip extensions, holds, jump rope, kips, L-sits, lunges, muscle-ups, pirouettes, pull-ups, push-ups, ring dips, rope climbs, scales, and sit-ups. For distance and endurance, it’s biking, running, swimming, and rowing. Weight training is a mix of barbell snatches, bench presses, clean lifts, deadlifts, kettlebell swings, power cleans, push presses, snatches, squats, thrusters, and wallballs with a medicine ball. The key is to constantly move, constantly challenge yourself and constantly advance your abilities; to become measurably stronger, faster, and fitter. And due to CrossFit’s intensity level, it also yields a very high calorie-burning capacity with the actual count based on the participant’s physical abilities, weight and aerobic capacity on top of the actual workout itself. When it comes to nutrition, CrossFit devotees typically indulge on a diet rich in vegetables, lean meats, nuts and seeds and, in more particulars, 30 percent protein, 40 percent carbohydrates and 30 percent fat, with the principles and guidelines of the CrossFit diet duplicating those in the Paleo Diet. Hence by combining two very distinct lifestyles together, participants will not only feel better but also perform better and possibly experience mouth-dropping results. So if you have your own curiosity about CrossFit, check out a local CrossFit gym. Most offer free passes or the first month at a discount so you can first hand determine if this fitness program is for you. You never know what you will discover unless you give it a go.